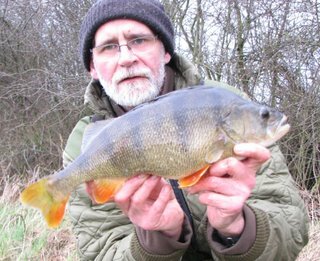 With the Bank Holiday forecast to be the start of a cold snap I had to squeeze a perch session in on the Thursday - as the Wednesday was forecast to be sunny I preferred the prospect of reasonably mild rain and it's accompanying overcast sky. I got the rain all right, it started shortly after I set up. I hadn't counted on the wind though. I knew it was going to get up from the breeze at dawn, but I hadn't anticipated that it would swing round - or quite how strong it would get. Bites didn't come straight away, it took about an hour and a half for the first perch to pick up a lobworm, and two more hours for the second bite to be missed. The approach was maggot feeder on both rods, one starting out with lobworm as hookbait and the other a bunch of red maggots. After the first fish both rods were on worm. As the wind was initially coming from my left the brolly was standing up to the wind with ease, even though it wasn't fully pegged down owing to the nature of the swim. When the wind swung round to blow almost straight in my face I had to re-angle the brolly. Again this started out all right, keeping the wind and rain off me. I kept recasting at intervals, despite the lack of attention the baits were getting, to keep the maggots going in. For once I was trying to be accurate with the line on both reels clipped up to ensure the feed and baits were landing in the same area each time. This was quite important with the strength of the wind hindering casting. The next fish came at one twenty. The rain had stopped. This was the start of a period of action that lasted until half past three or so. I missed a few bites, but often a bite on one rod was followed by a bite on the other rod. 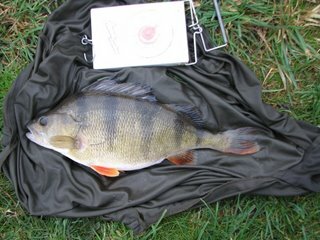 A sign that the perch were moving through the swim in groups, which is common with perch being mobile hunters in my experience. During this hot period I landed six perch. Then the sun tried to break through the cloud and the bites dried up again. Also during this period the wind really picked up, and I spent much time hanging on to the centre pole of the brolly. When the pole pulled out of the ground while I was playing one of the perch it was time to take the thing down and hope the rain held off. If it set in again I was going to pack up! Luckily it didn't. It was almost five o'clock when the next fish came along, the sun having gone in again. It was not the signal of another flurry of activity. A bite was missed and a final perch landed just after six. That turned out to be my lot. A day that had started out slow, and fairly miserable crouched under the damp brolly, turned out as rather good. Nine perch landed, averaging over 2lb apiece, the biggest being a three pounder.